We depend on your generosity to continue our work. Sponsor one of our fundraising events, or register to attend. 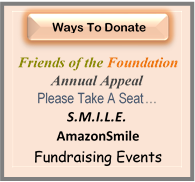 Join us as a Friend of the Foundation by sending a tax-deductible donation. Show your appreciation to someone who has made a difference in your life or your child’s life. However you choose to partner with us, know that your contributions to the Montville Education Foundation, Inc. remain in our community to benefit our citizens. MEF is a non-profit 501 (c) (3) corporation. Contributions to the Foundation are tax-deductible to the fullest extent of the law.